When trying to get your content seen on Pinterest, there are 2 things you need to worry about: Having a totally pin-worthy image, and your pin description. Pinterest is what I like to call a Visual search engine. That is to say, we find content thanks to SEO (search engine optimization), but we click on our favorite pretty pictures. It’s important that you know how to write great Pinterest image descriptions so that you show up in search queries where you want to be found. In this post I’m going to share with you how to make the most of your pin descriptions, including everywhere a description should be, best practices, and how they appear on Pinterest. A Pinterest image description is shown next to an image on Pinterest after you click to expand it. This description should explain to the viewer what they should expect to find if they click through the image to a website. 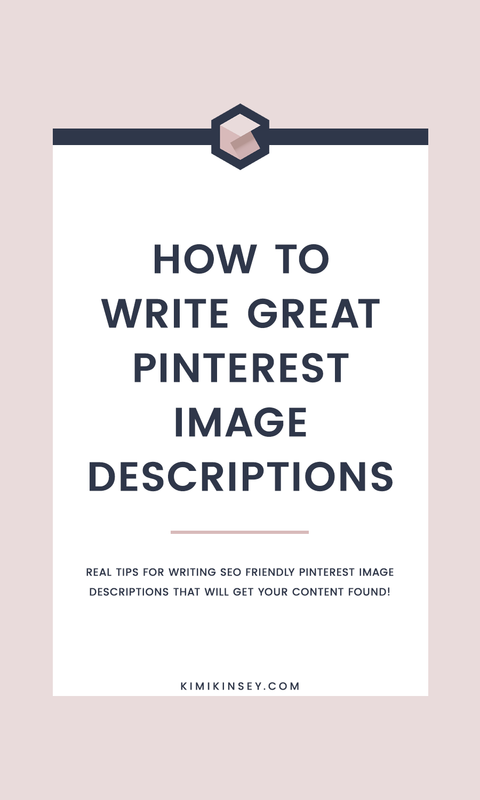 These image descriptions aren’t just for helping Pinterest users – they help you too! Descriptions should include the kind of keywords or phrases that someone would naturally search for if they were looking for your content. When someone pins directly from your website, we want them to be met with an appropriate description – because we want the pin to perform well! You can attempt to have some control over the description that gets used by putting it in your Alt-Text area as seen below. When someone pins from your blog, the description area on Pinterest will auto-populate and give them the opportunity to edit it and write their own information. The best way to provide your description to Pinterest is through the use of the “data-pin-description”. WHAT THE HECK IS THE “DATA-PIN-DESCRIPTION”? It’s a special tag that tells Pinterest what your image’s description is. It’s the preferred way of displaying this information as it doesn’t prevent the proper use of your Alt Text, which shown in the event that the image is unable to load or to help describe the image to the visually impaired. Below is an example of my data-pin-description for my pin image in my blog post How Ultimate Bundles can double you Affiliate income. I’m using an awesome plugin called Tasty Pins that provides an area for you to input the description at media upload so you don’t have to code the whole thing out yourself. When someone clicks to pin an image from your website, the description on Pinterest is going to auto-populate the information you put in your data-pin-description area. Make sure you include the information you want them posting – although they will have the opportunity to change it if they would like to. What does this all look like on Pinterest? Post Name: This is coming from meta data established in Yoast SEO and using the title I gave it within Yoast rather than the title I gave the image itself. 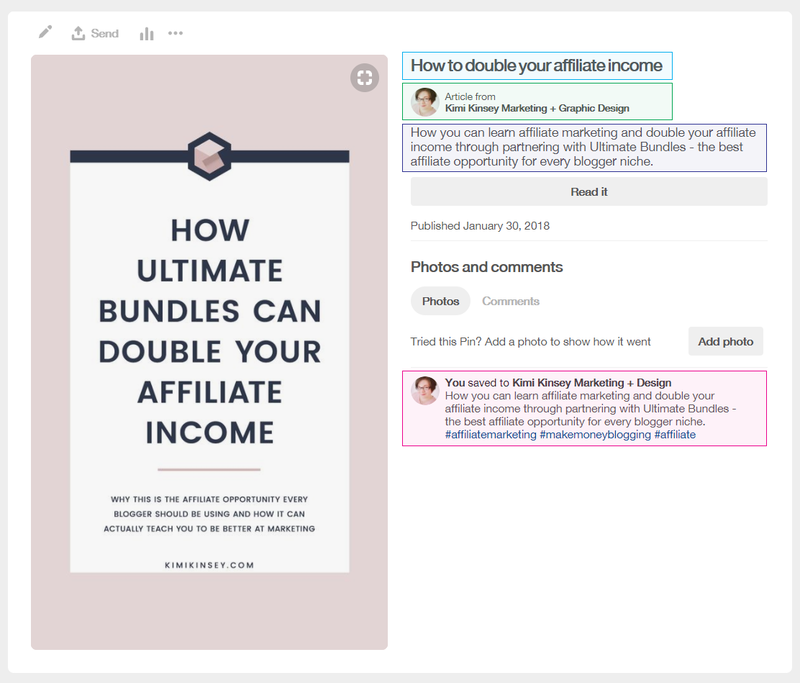 Author: With Rich Pins enabled and my website verified, Pinterest is able to connect that this pin’s associated article is authored by my account. It’ll show this way no matter who pins the content. Article Description: Original description being pulled from Yoast SEO. It’s the description I wrote for the snippet preview. It also shows up this way on Facebook and on Google. Pinterest Description: This is the description I entered via the data-pin-description using Tasty Pins. When someone pins the image, this information is auto-populated. Pro Tip: Be sure to name your images appropriately. 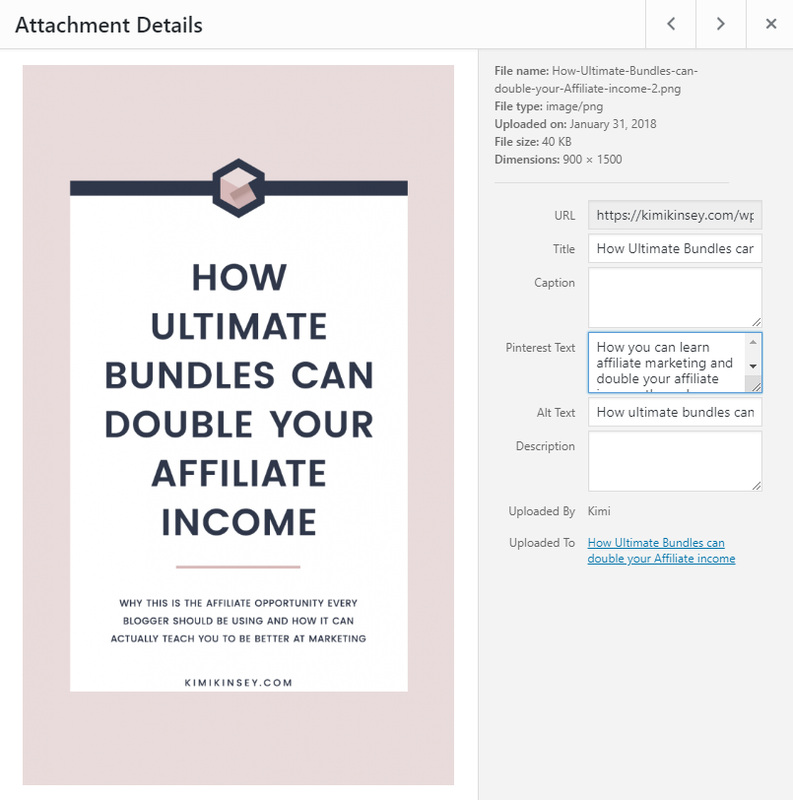 Notice I named mine “How Ultimate Bundles can double you Affiliate income” rather than something generic like “UB affiliate post pin”. It’s always good practice to use keyword rich names anddescriptions anywhere you can – it’s great for SEO! Okay, so how do I write awesome descriptions!? I can’t say this enough times: Pinterest is a SEARCH ENGINE. That means you have treat your pin descriptions like anything else SEO related. Keywords are, well… key. Think about your blog post and ask yourself “What would I search for if I were looking for this information?” and “What searches do I want my pin to show up for?”. These key words need to be included somehow in our description through the use of proper sentences. We don’t want to only keyword stuff (that is to say, put only keyword strings) – the more natural, the better. Use your key words to make complete sentences. HUGE SEO tip for you here… the closer your sentences match what someone searched for, the more likely your pin is to show up first in results. Step 3: Hashtags?… On Pinterest!? It’s true. Pinterest has spent many years deterring us from using hashtags, but are now endorsing the usage of hashtags (September 2017) and are giving them high visibility in search results. Needless to say… if you aren’t using hashtags yet, it’s time to get with it! According to Pinterest, when a user searches a hashtag the freshest pins with that hashtag will appear at the top of the feed. That’s HUGE! So let’s choose a few hashtags for your pin. I recommend 3-5, but Pinterest says “no more than 20 hashtags per Pin”. Looking for an easier way that’s even better for SEO? Check out the WPTasty Premium WordPress plugin. It provides you with a Pinterest specific description area for your media while still allowing you the space to enter an alternate description better fitting of the image itself. Want access to my Pinterest Hashtag Database? Enroll in my course Get Pinned Academy and you’ll get INSTANT LIFETIME ACCESS to my hashtag database and printable guide for free as part of your course enrollment. Or, you can buy it separately. Buy the Pinterest Hashtag Database Now!